Reader Works is no longer available! This article assumes prior knowledge and use of Microsoft Reader as a Proofreading Tool. If you have recently installed Windows Vista, as I did, and setup Microsoft Reader, and tried to install the read add in for Microsoft Word. You have, probably, found that the Reader icon does not show up on the standard toolbar in Microsoft Word XP; even though; the add-in has been installed. Additionally, there is no need to install Microsoft’s text to speech package, for it is part of Windows Vista. After downloading and installing Reader Works, open the program and you will see the following. The top radio button is selected; click OK. This will open what is called a blank project. After the blank project is open, click Add. Select the Word document that is ready to be proofread and add it to the project. At this point, the Word document is ready to be turned into an ebook. Therefore, as shown in the figure below, click the eBook build icon. Once the ebook build icon is clicked, Reader Works constructs the ebook. 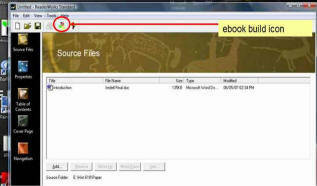 Here the ebook file is given a name and a storage location. For the sake of convenience, I save my proofreading ebook files to the desktop. 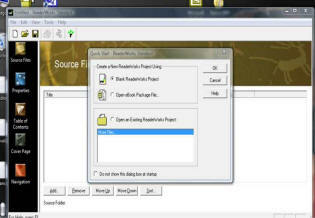 After the ebook has been created, Microsoft Reader opens the file automatically ready for proofreading. There are other capabilities that the program provides the user, the most important is that it runs on Windows Vista. Additionally, there are also some drawbacks, while they are worth mentioning, they do not effect proofreading. Reader Works does not integrate pictures into the ebook properly, that is to say, the pictures do not look the same in the ebook file as they do in the Word document. Only parts of some pictures are visible, while others are completely visible and in the proper position. The other drawback is only the most basic parts of the program function in free-mode. However, as I said, these drawbacks do not effect proofreading, and that makes the program useful for those who are running Windows Vista and Microsoft Word XP.